This past Friday, I did a jewelry show at the UNI(University of Northern Iowa) Maucker Union. Despite the table being small(6ft) and the price of the table, I enjoy this arena. I meet a lot of people, some old customers, some new. I sit in an area where people have to pass me to get to other areas of the union. The Maucker is a hang out for the college kids. They meet, greet, and eat. They also have on site bank and meeting rooms. Perfect setup. I did well. I even have some orders I have to fill for new clients. Turned out to be a nice day. Prior to this I had an uneasy feeling. Maybe I was not prepared, or maybe I did not have enough merchandise. I just wasn't feeling it. Days before the show, I could not find my fliers, I lost my pliers and my thoughts was not on jewelry. Nothing was coming to mind about what to make. I had a block. Adding insult to injury, my work schedule had changed and I would have to work until 8:00 the night before the show. I had talked with one of my friends who changed her schedule, she suggested I do the same. It took me a while to go and talk with my lead teacher, but she gave me the OK to work another day. My mind started churning and I felt that old familiar tingle. Ideas was popping in my head and I started to think about jewelry again. This was Tuesday afternoon. Once I arrived home, I started getting things prepared, prepackaging. I had planned to make jewelry all day Thursday. Wednesday night, I packed my bags with bags, receipt books, jewelry stands and all my other "stuff". I also had a fail safe. I can cancel the show with one days notice without being charged. OK, things did not go as planned. 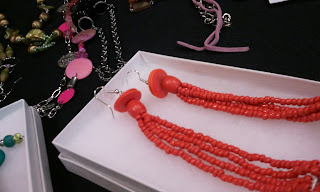 I did not get started until 12:00 and I was up until 2:30 that morning, still making jewelry. Some doubts started creeping up. Do I have enough merchandise to cover the table, my time and materials. At this point I had no choice but to go ahead with the show. I couldn't cancel. I finished making making jewelry and started to pack my jewelry for transport. My merchandise looked pretty low. You do what you gotta do. If you don't know, there is a GOD. 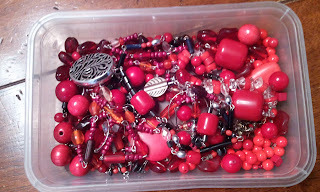 While unpacking, some how I had packed a bag of earring necklaces and bracelets that I had made some time ago. Thank you GOD. My outlook felt better and better. What started as apprehension, turned out to be a pretty good day. As with all my shows, I take pictures. 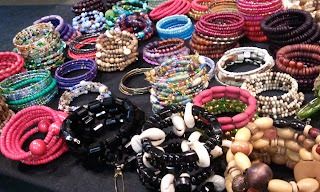 For some reason, I love making memory wire bracelets. This piece I created after 12:00am. I love orange for fall or summer. 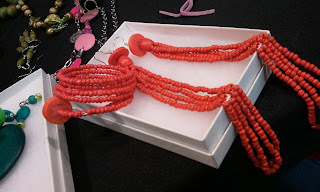 I made the set with glass seed beads. long, light weight and chic earrings. You can see other merchandise on my table. I love it. I won't tell you if I sold it or not. Next time. I promise to make a set for one of the ladies who works there. She wants a red necklace for her sister. 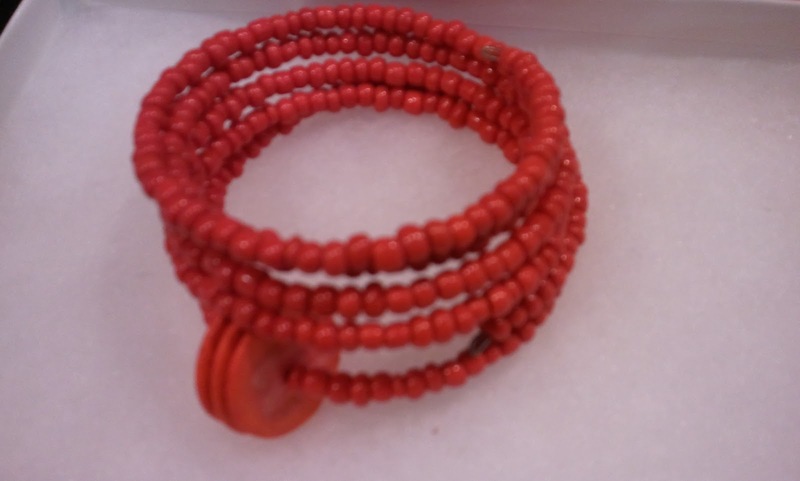 These are all the red beads Ihave left. She wants different shades of red and silver. The finished project on the next post. See ya.